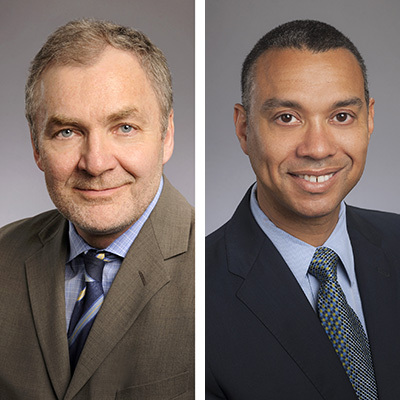 Walter J. Curran, Jr., MD, and Christopher Flowers, MD, MS, will be named Fellows of the American Society of Clinical Oncology (ASCO) during its annual meeting to be held June 1-5 in Chicago. Winship Cancer Institute Executive Director Walter J. Curran, Jr., MD, and Christopher Flowers, MD, MS, director of the Emory Lymphoma Program, will be named Fellows of the American Society of Clinical Oncology (ASCO) during its annual meeting to be held June 1-5 in Chicago. Curran and Flowers will be recognized along with other global oncology leaders for their extraordinary volunteer service, dedication, and commitment to the society. "I am honored to be recognized along with my colleague, Dr. Chris Flowers, at one of the most important oncology conferences in the world by the leading group of cancer care providers and researchers," says Curran, who has served as a member of the ASCO Board of Directors since 2014. Through his work with ASCO, Flowers has been instrumental in helping to develop national guidelines for the management of cancer patients and for leading ASCO's Health Disparities Committee. Curran and Flowers will join more than two dozen other Winship members who are presenting their cancer research results at the meeting. The theme of this year’s ASCO conference is "Delivering Discoveries: Expanding the Reach of Precision Medicine." Winship Deputy Director Suresh Ramalingam, MD, says "the meeting will feature a number of important studies that move immunotherapy to the forefront of care for patients with a variety of cancers. Personalizing treatment based on tumor characteristics is another major theme. In lung cancer, we look forward to studies that compare immunotherapy to chemotherapy, that combine immunotherapy with chemotherapy, and that report on exciting targeted agents." Sibo Tian, MD, a Winship radiation oncology resident, is the recipient of a 2018 Conquer Cancer Foundation of ASCO Merit Award for his abstract: "Survival Outcomes by HPV Status in Non-oropharyngeal Head and Neck Cancers: A Propensity Score Matched Analysis of Population Level Data." Tian will present his research during an oral abstract presentation on Sunday. Flowers will serve as co-chair of an oral abstract session on Saturday on "Hematologic Malignancies - Lymphoma and Chronic Lymphocytic Leukemia." Winship radiation oncologist Kristin Higgins, MD, will serve as co-chair of a poster discussion session on Sunday on "Lung Cancer - Non-Small Cell Local-Regional/Small Cell/Other Thoracic Cancers." Several Winship members will participate in educational sessions throughout the conference. On Friday, Jane Meisel, MD, will chair a session titled: "On the Shoulders of Giants: Breast Cancer - Where Precision Medicine Began." Ragini Kudchadkar, MD, will chair a session on "Practice-Changing Developments in Stage III Melanoma: Surgery, Adjuvant Targeted Therapy, and Immunotherapy." Sharon Castellino, MD, will speak at an educational session on Sunday on the "Proof-of-Paradigm of Cost Effectiveness Analysis Within a Therapeutic Clinical Trial." On Monday, Rebecca Pentz, PhD, will discuss "Ethical Issues Surrounding the Care of Colleagues and Friends." Taofeek Owonikoko, MD, PhD, will speak on the "Role of Immunotherapy in Small Cell Lung Cancer." R. Donald Harvey, PharmD, will chair a session on "The Emergence of Cancer Biosimilars in the United States: A Clinician's Guide." Harvey will be a discussant earlier on Monday in a clinical science symposium on "The Arrival of Biosimilars." Abstracts from this year's ASCO meeting are available for online viewing.